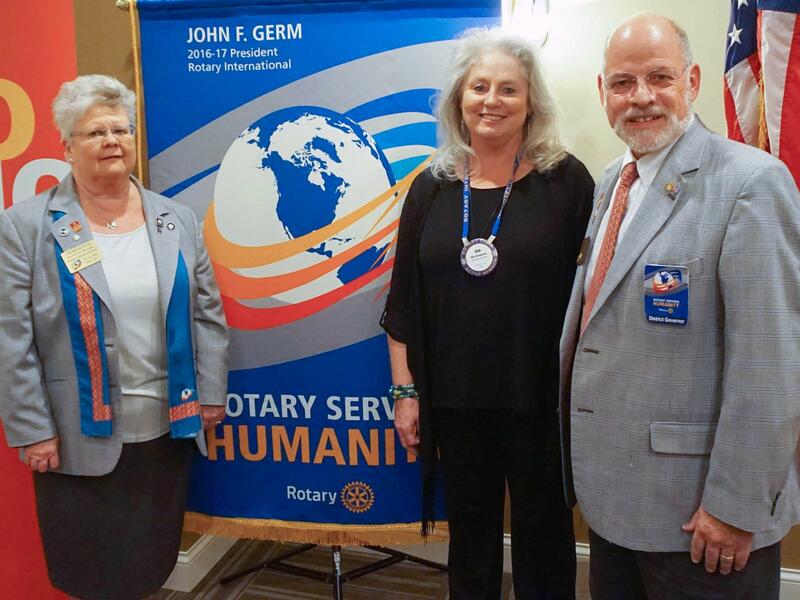 Rotary File for September 27, 2016 | Rotary Club of Iowa City A.M. The Sept. 27th presenter was District Governor, Chris Knapp. 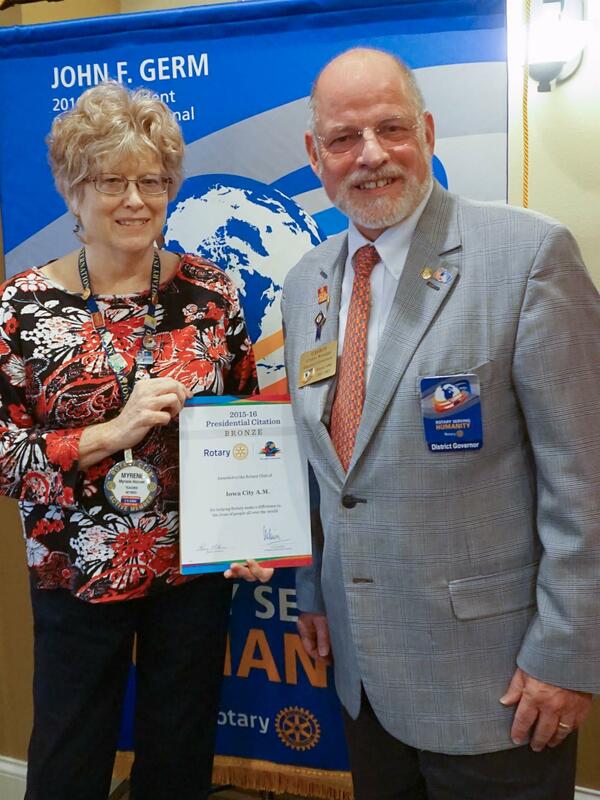 District Governor Chris Knapp presented the RI Presidential Citation Bronze Level for 2015-16 to AM Rotary. It was accepted by 2015-16 President Myrene Hoover. On Oct 5 there will be a Rotary One Summit in West Liberty for club training at the District level on Foundation, Membership and Public Image. There is a light supper prior to the meeting. Sign up by next Monday on the District website. On October 8 from 9-12 we will hold a flea market fund-raiser in front of the Lucky's market at Sycamore Mall. We need people to sign up to help that morning from 7 am on. On October 10 the area Rotary Clubs will jointly sponsor a Polio Awareness dinner and talk at the lodge at Terry Trueblood park from 5:30 to 7:30. The minimum donation is $25 per person. The goal is to raise $5000 for Polio Plus on behalf of all the local clubs. Oct 11 is the deadline for nut sales. Get sales sheets and money to Nancy Pacha, or if you prefer not to buy nuts and want to just contribute to RYLA and World Affairs Seminar student participation Nancy has forms for just money donations. A Fireside chat for newer members and prospective members is Sept 28 at 5:30 at Ron Logsden's home. Consult the calendar at the website for location information. All members are invited. Cassie Elton and the Antelope Lending Library were honored by the Center for the Book as literacy organization of the year. Assistant DG Peggy Doerge introduced DG Chris Knapp and his partner, Vernette Knapp. Chris has been a charter member of the AM Rotary for 27 years while Vernette has been an official member for 4 years. Chris and Vernette met at 1st National Bank, which later became US Bank. Together they had 77 years of experience with that organization. As far as Rotary goes, Chris became involved in Youth Exchange almost from day one and has hosted 8 exchange students over the years. Governor Chris began by giving all the coming Rotary event information. The District Conference will be at the Coralville Marriott May 4-6. Hopefully most club members will attend at least part of the conference. District Assembly will be 3/25/17 and is a good training opportunity for club officers as well as informational for all Rotarians. The next Rotary Leadership Institute dates are 10/15 (Iowa City), 4/1 (Des Moines), 6/3 (Omaha), 9/30 (Iowa City), 10/21 (Omaha). Some members will want to attend the RI Conference in Atlanta June 10-14, 2017. The two major areas of celebration will be the 100th anniversary of the RI Foundation and further work toward the eradication of polio. 1. Increasing foundation giving above last year's levels. 6. Raising at least $100 per member for RAG4CLUBFOOT.